Since 1994, we have been the state office of dispute resolution for Alabama. At the Center, we work with the courts, the Alabama State Bar, state agencies, schools, community mediation initiatives, and businesses to promote early and peaceful resolution of disputes. The Center serves as the administrative arm of the Alabama Supreme Court Commission on Dispute Resolution. the 2018 Mediation Week Proclamation. 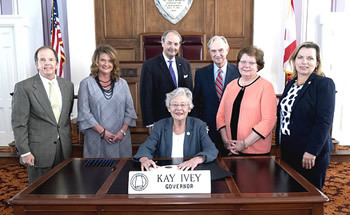 Pictured are (seated) Alabama Gov Kay Ivey, (standing l to r) Alabama Supreme Court Commission members Scott Hoyem, Lynn DeVaughn, Justice Will Sellers, and William Coleman, ACDR Exec Director Eileen Harris, and Alabama State Bar President-Elect Christy Crow. View these Collaborative Law Practice Videos. The Hype about HIPAA and HITECH - Samarria Munnerlyn Dunson, J.D., CHC, CHPC, walks you through HIPAA Basics, Business Associates, HITECH, Charging for Medical Records-Latest Guidance, Enforcement Update, and HIPAA on the Horizon. Learn more and view this video. This four-part series of free 60 minute webinars will guide you through the ins and outs of collaborative law practice Register for one or more webinars. All webinars begin at noon and end at 1 p.m. You must register at least two days prior to the event. The webinars have been approved for one hour of MCLE credit each. This series is sponsored by: the Alabama Center for Dispute Resolution, the Birmingham Bar Association – Collaborative Law Committee, Birmingham Collaborative Law Alliance, and the Dispute Resolution and Solo/Small Firms Sections of the Alabama State Bar. Learn more and register for the Collaborative Law Webinar series. Take advantage of upcoming training opportunities sponsored by the Alabama State Bar Section on Dispute Resolution and the Alabama Center for Dispute Resolution.